will go to great lengths to keep them as surprises.” Although happily married and the father of seven-year-old twins, Mark admits “come over on Thursday when he’s playing golf” is something he hears fairly frequently. Africa’s landscapes and wildlife feature in much of Mark’s exhibition work but the bulk of his painting time is taken up with dogs, horses and hounds. As Master and huntsman of the Wilton, he takes particular pleasure in painting the latter. But whatever the canine, Mark insists on meeting it and taking his own photographs. Spaniels leaping into ponds and terriers rolling in fox poo minutes before their photo shoot are par for the course, believes Kate Brooks. “I’ll never forget a lurcher that kept diving out of camera shot. Later I learnt my camera’s beep was identical to the warning given by his shock collar,” she says. sort of stuff that gets Neighbourhood Watch rather excited. an opportunity to learn about it.” Not everything always goes to plan. Amelia works mainly from photographs sent to her, which is handy when it comes to horses: “I’m allergic to them. 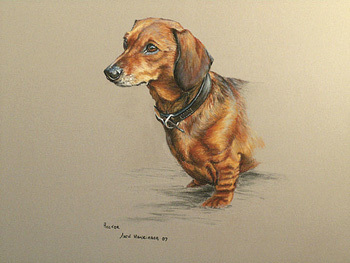 Luckily, I’ve no such problems with dogs.” Like most artists, she is happy to alter a picture if a client feels she hasn’t quite captured their pet. “It doesn’t happen often. I painted a horse from a picture that must have been over-exposed. I thought it was bay but later learnt it was chestnut,” she recalls. Matching coat colour isn’t a consideration for Anne Nichol-Smith – known as Nicky – who works only in pencil. “With a really sharp pencil you can capture so much detail: I’m fascinated by how the fur lies and the bone structure beneath; plotting the curls on something like a Bedlington terrier is extremely satisfying,” she says. Given that Camilla’s studio is in an idyllic Hampshire barn where chickens wander in and out and barn owls hoot overhead, one wonders whether clients concoct excuses for re-turn visits. “I ask that dogs come here so I can do some drawing from life. As you can imagine, this can be interesting, not to mention messy. Some dogs can’t control their excitement, so there are endless stains on the carpet,” she says with good humour. were no worse for his tumble. Dawn Warr, artist and self-employed keeper, agrees that labs can be a challenge. “Having good light is crucial as the shine in the jacket brings out the contours and character in the face. I must be a grubby worker because I end up with black dust all over my hands, hair and face – I start resembling the dog,” she says. Although most artists will do their best to paint a dog that has gone to the happy hunting ground, Dawn takes this a step further: “I’m also a taxidermist and have stuffed a few dogs. I remember a lady who came up to me with a frail little terrier. ‘When this dies, I want it stuffed. I can’t stand the dog but my husband loves it,’ she announced. And a chap joked that he wanted his dog stuffed to rest his feet on but later admitted he took it to work every day and even on holiday. “It’s not something I’d do with my own dogs as taxidermy simply doesn’t capture the character you can with a portrait and it’s not for everyone,” admits Dawn. When it comes to betting on a certainty in the Christmas-present stakes, a portrait certainly seems the safer option.